Restores normal functions to the liver, dissipating heat, detoxifying, strengthening spleen and liver, lowering the content of Ammonia Enzymes, activating blood circulation, activating immunity ability in body. excreting pathogenic dampness, clearing liver from stasis that obstructs the normal flow of vital energy and relieves pain. Hepatitis is a common disease with frequent relapses that takes a long convalescence for total recovery. So it seriously affects human health and has become a health hazard deserving immediate attention. In Chinese Medical interpretation, Hepatitis is caused by the culmination of toxins, pathogenic heat and damp factors in the Cholehepatic System – The Liver and Gallbladder. Liver Support No. 1 is manufactured by applying modern scientific process in the extraction of vital ingredients from various expansive and effective Chinese herbal medicine. Liver Support No. 1 is regarded as more effective in curing or acting as a preventative agent for infectious, chronic interstitial and virus hepatitis in comparison with other medications on the market. For infectious, chronic interstitial and virus hepatitis for both A and B type. Liver functioning depressingly; dysfunction of gastrosplenic transmission and assimilation ability, stagnation of vital energy, blood stasis, hepatodynia, hypatosplenomegaly, hepatocirrhosis, fatigue, anorexia, nausea. Adults take 4 capsules, 3 times a day. Children’s dosage to be reduced proportionately. Take continuously for 2 months as first treatment. 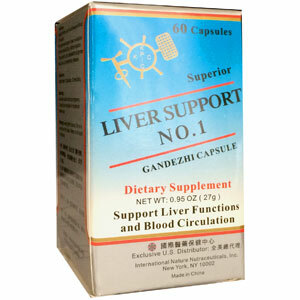 After liver restores its normal functions, one more month of dosage is required for liver strengthening treatment. Use with caution during pregnancy. Consult your herbalist or physician before use.